“How many x86 servers will be needed to replace our mainframe ?” This is the initial question that we inevitably face in all the projects that we do at Eranea when we transform mainframe applications to x86. The sysadmin usually asking this question thinks that a swarm of Xeon-equipped machines will be required. Let's debunk that myth: the very recent world record on the SpecJBB2013 benchmark by Cisco gives us the proper opportunity. Let's start by setting the stage: over the decades of existence of the mainframe, IBM used a constant unit to compare the various generation of its high-end systems. It is the MIPS : Millions of Instructions per Second (see Wikipedia here for details). A MIPS of System/360 announced in 1964 represents the same raw computing power as a MIPS of the most recent z13, introduced last year. The only difference : the z13 of 2015 can deliver much much more MIPS than the 360 of 1964. Thanks to Moore's Law (see here) ! That is also the reason why IBM himself uses the MIPS to measure the health of its mainframe business in the financial reports, when publishing the evolution of MIPS sold over last quarter. So, the MIPS clearly allows to compare apples to apples and to remain coherent across various system generations over an extended period of time : sysadmins very often use it to compare the power of the mainframe systems used by their respective corporations. In 2013, HPE published a very interesting paper (get it here) about the results of its proprietary zRef benchmark which compares the same Cobol programs (transactional and batch) executed both on mainframes and on x86 servers. A summary of the detailed results: 1'000 MIPS of mainframe power can be replaced with better performances (on this benchmark) by a single server HP DL980 equipped with 8 Xeon E7-4870 (2.4 GHz, 10 cores / Xeon, 1 TB RAM). Now, let's use to a public benchmark to be able to do the full comparison over time: we will use SpecJBB2013 (described here) that Eranea runs recurringly in its daily activities to assess the power of the systems on which we deploy the applications that we convert to Java. SpecJBB2013 is inspired by the famous TPC-C benchmark and was adapted to evaluate transactional performances of Java environments. 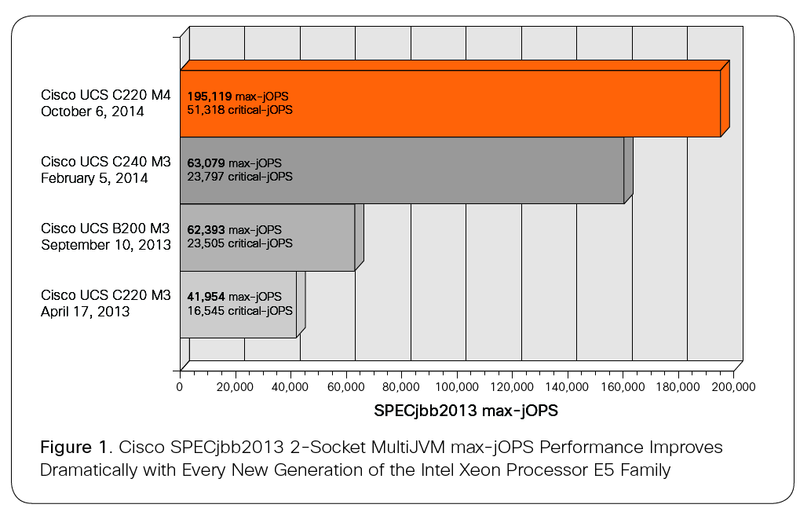 In early 2013, Redhat published results (see here) regarding SpecJBB2013 with same processor used by HPE in its zRef paper: they reached 13'812 critical-jOPS per second for a machine equipped with 4 similar E7-4870 Xeon processors. You do not know what critical-jOPs are ? It does not really matter here: just take it as a unit to measure relative performance improvement of the x86 Xeon architecture ! Let's now fast forward to June 2016: Cisco published in June 2016 a world record (seehere) on the same SpecJBB2013 improving 30% when compared to previous generation. On a single blade / server equipped with 4 Xeon E7-8800 v4 processors, the UCS C460 M4 server could deliver 128'890 critical-jOPS per second. 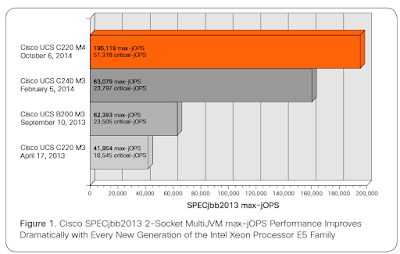 Let's do some maths : (128'890 jOPS for Cisco/ 13'812 jOPS for RedHat) / (8 Xeons for HP / 4 Xeons for RedHat) = 4.66. So, the current Cisco UCS machine, seen a the high-end server / blade of today, is 4 times more powerful that the HP DL980 of 2013, high-end server of that time ! By the way, this boost in performance is not a one-shot event : in another paper (seehere) describing evolution between April 2013 and October 2014, Cisco clearly demonstrates that improvement of x86 architecture is a fast-pace and recurring phenomenon. Across 4 generations of its fast-evolving servers in 18 months, UCS family could deliver a 3-fold improvement of performances for SpecJBB2013. Figure 1 (coming from Cisco's paper) represents this rapid evolution. What it all means : if it was possible, according to HPE, to replace 1'000 MIPS of mainframe by a single x86 server in 2013 from a raw processing power standpoint, it is even easier to do so in 2016 as Moore's Law has continued to produce its beneficial effects ! A single machine can now deliver the equivalent of a couple of thousands of mainframe MIPS. I cannot disclose here (because of stringent NDAs tying us to our customers) precise figures about our own projects but I can confirm, generically speaking, that raw x86 power is no longer a concern for many years: we never run short of cpu cycles (by far and away ...) nor need vast swarms of Xeon-equipped servers / blades to replace legacy mainframes. After the first initial question regarding cpu power, we usually get a second question regarding I/Os Per Second (IOPS). In that case, the perception is usually also not correct: most people do not realize that the x86 architecture has done tremendous progress in the last decade ! Most advanced storage systems (flash arrays) for x86 servers can now deliver over 5 millions IOPs at an incredible price / performance ratio, according to the Storage Performance Council reports (see here). Last May, in catch-up mode, IBM announced (see here) its own DS888 flash-array, aimed at improving top mainframe I/O performances through peaks at 2.5 M IOPs. So, here again, x86 architecture is minimally on par with mainframe. Conclusion: you should not worry about raw x86 performances (computing power and IOPs) when you migrate your mainframe applications : that is definitely not the pain point ! And it will even get better as Moore's Law will continue to improve the situation for at least 10 more years (interesting article on ArsTechnica : here). You should rather concentrate on properly designed DevOps procedures to leverage optimally the agility delivered by your new cloud architecture: forget the MIPS to focus on the time that you can shave to deploy new application versions faster ! You will, then, not only enjoy the huge cost savings delivered by the incredible price / performance ratio of the x86 architecture when compared to mainframe : you will also deeply improve your time to market and, consequently, please your users and customers! 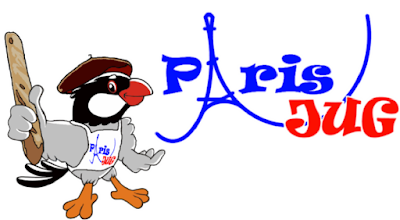 Un grand merci à Charles et son équipe associative du JUG Paris pour leur accueil vraiment sympa et leur hospitalité ! 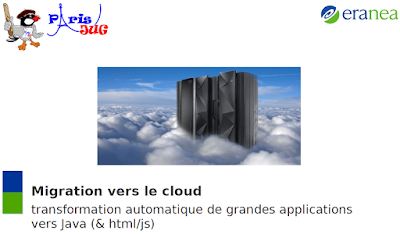 Les slides de notre (=Eranea) récente présentation concernant la transformation automatisée et iso-fonctionnelle d'applications mainframe/Cobol vers Java/web pour le cloud computing sont en ligne sur le site de l'association. Voir nos projets de référence en page 2 : multiples systèmes critiques ainsi transformés. Cool le logo JUG ! Non ? Eranea présentera sa technologie de transformation automatisée des applications "coeur de métier" sur mainframe (Cobol) vers Java pour le cloud computing au Java User Group à Paris le 10 Mai 2016. Une large place sera faite aux démonstrations pratiques de nos divers outils : un bon moyen de vous faire une idée concrète sur notre solution et surtout du vaste outillage qui la "met en musique". Tous les détails pratiques de la rencontre sur cette page du site du JUG Paris. Eranea édite une solution de transformation de système "legacy" (mainframe, Cobol, etc.) vers Java afin de permettre à ses clients de basculer vers le cloud computing tout en préservant leurs investissements logiciels stratégiques. Cette technologie poursuit des objectifs tactiques (économies) et stratégiques (modernisation technologique, transformations diverses, alignement standards actuels, etc.). Les outils produisent, 100% automatiquement et en mode continu (DevOps), une application Java (avec interface web) qui est strictement iso-fonctionnelle par rapport à l'application d'origine. améliorations des services (interface, interopérabilité, etc.). Cette présentation générale sera étayée par des cas et chiffres concrets tirés de projet réalisés récemment : banque privée internationale, société de marketing bancaire, administration, etc. Elle exposera les "bonnes recette" et la sécurité de migration apportée par la transformation automatique et l'iso-fonctionnalité, adaptables à d'autres technologies dans d'autres contextes. Le PGDay France 2016 aura lieu le 31 Mai 2016 à Lille. C'est un "moment de rencontres et de conférences pour la communauté francophone de PostgreSQL. Les conférences s'adressent à tous les utilisateurs du logiciel : étudiants, administrateurs systèmes, DBA, développeurs, chefs de Projets, décideurs, etc "
Nous avons le plaisir d'y faire une présentation parmi un ensemble de thèmes tous plus intéressants les uns que les autres : les détails du programme complet sont ici http://www.pgday.fr/programme.html. "En 2015, le Gartner Group a validé l'applicabilité des bases de données Open Source, en particulier PostgreSQL, à la gestion des données des grandes applications critiques dans les entreprises et a donc annoncé une forte croissance de son utilisation dans les 3 ans, en particulier pour les nouvelles applications. Mais, comment s'y prendre quand l'application critique de son entreprise fonctionne sur une autre de données ? Cette présentation, à travers de multiples expériences concrètes sur des projets de grande taille décrira les clefs de la réussite d'un projet de migration depuis un sgbd propriétaire (Db2, Oracle, etc.) vers PostgreSQL : iso-fonctionnalité, transparence, incrémentalité, etc. Elle détaillera les meilleures pratiques, la bonne structuration, l'outillage nécessaire à un projet pour le conduire au succès. A travers différents points de compatibilité, elle établira un panorama de la problématique complète à traiter dans un tel projet de transformation vers PostgreSQL. " Au plaisir d'une rencontre là-bas et d'une discussion intense autour d'une bonne bière du Nord ! Docker sur LinuxOne (mainframe) : taille XXL ! Un million de conteneurs en parallèle. IBM a réalisé ce qui doit clairement être le record du monde actuel : le démarrage simultané d'un million de conteneurs Docker sur un seul mainframe. Le vecteur de ce record est le modèle Emperor, basé sur la génération z13 de processeurs, qui fait partie de sa ligne de produits LinuxOne, les mainframes dédiés exclusivement à Linux. Quelle est logique d'une telle démarche qui permet finalement d'apporter les bénéfices de l'architecture en conteneurs sur des systèmes qui restent au coeur de l'informatique des plus grandes entreprises ? Spin-off pour la pépite Amazon AWS avec 8 milliards annuels et 40% des profits opérationnels globaux? A 8 milliards de dollars de chiffre d'affaires annuel, soit 7% du total mais 40% des profits opérationnels globaux pour 2015, Amazon a-t-il intérêt à garder AWS, sa pépite du cloud computing financièrement « noyée » dans les ratios financiers (taux de marge, etc.) de la maison-mère, certes clairement leader mondial incontesté du commerce en ligne mais jugée par Wall Street sur des fondamentaux boursiers totalement différents ? Docker acquiert UniKernel - Less is more ! Docker Inc, la société éponyme de la technologie de conteneurs logiciels la plus en vogue actuellement, vient d'annoncer l'acquisition de la société Unikernel (fondée par les leaders de l'hyperviseur Xen de virtualisation, donc des développeurs éminemment respectés dans le monde virtualisation / isolation), pour catalyser sa stratégie du minimalisme logiciel. Nouvel article publiés sur LinkedIn. Pour le lire en entier, c'est ici. Transformation d'applications sur mainframes (Cobol le plus souvent) vers Java / Linux sur serveurs x86, tant pour réaliser des économies que pour effectuer une modernisation massive à travers le saut technologique quantique associé. Dans ces projets, nos clients veulent augmenter l'agilité, la scalabilité et la résilience de leurs applications pour poser les fondations de leur transformation digitale et ainsi disposer des meilleurs systèmes pour lutter efficacement contre les Ubers ou autres FinTechs de leur industrie. Pratique #1 : le voyage est aussi important que la destination ! Pratique #2 : des petits pas très fréquents plutôt que des bonds quantiques intermittents ! Pratique #3: éviter de mélanger torchons et serviettes ! Pratique #4: les mêmes résultats au nano-détail près ! Pratique #5 : tout passe par la machine et seulement par elle ! Bonus: structuration DevOps implicite en prime ! Mes billets sur la technologie proche du métier d'Eranea, la société dont je suis co-fondateur, sont actuellement directement publiés sur mon profil dans le réseau social LinkedIn. Cela explique le "trou" de publication sur ce blog depuis quelques temps. PostgreSQL 9.5 : les allocations familiales françaises gérées par l'Open Source ! Alors, pourquoi pas vos bases de données critiques ? [lien vers l'article] : une analyse de l'évolution très positive des moteurs de bases de données relationnelles issus du Logiciel Libre au cours des 5 dernières années. Ils sont désormais mûrs pour la gestion des données critiques de l'entreprise. Containers / Docker : +400% en 2015. Pourquoi ? Cas d'usage dans l'entreprise. [lien vers l'article]: les conteneurs logiciels et les plateformes PaaS / Caas sont actuellement une des technologies "bleeding edge". L'article analyse leurs apports aux équipes informatiques des grandes entreprises. Les datacenters privés basculent vers le cloud computing. [lien vers l'article] Une étude récente recense les parts de marché des grands opérateurs du cloud (Amazon AWs, Google, Microsoft, IBM) et leurs perspectives de croissance suite au changement d'attitude des grandes entreprises pour qui ces technologies qui deviennent maintenant "normales". Applications bancaires dans le cloud : bénédiction de la Finance Conduct Authority britannique. [lien vers l'article] L'autorité de tutelle britannique encourage les opérateurs financiers à basculer vers cloud computing: les fameuses FinTech pour "uberiser" les institutions traditionnelles et ces dernières pour lutter à armes égales contre leurs jeunes adversaires. Dans l'espoir d'une concurrence accrue finalement favorable aux clients! (Ré)-unification du Big Data (Hadoop) et du modèle relationnel: solutions SpliceMachine, Apache Drill. [lien vers l'article] La technologie Big Data est initialement partie sur sa propre voie technologique clairement dissociée des bases de données relationnelles classiques. Des solutions novatrices unifient Hadoop et le relationnel pour obtenir les avantages du "tout sous un même toit". Processeur quantique Google / NASA / D-Wave : 100 millions de fois plus rapide qu'un serveur x86 ! [lien vers l'article] La technologie des processeurs quantiques vient de démontrer des progrès significatifs et concrets pour une gamme ciblée de problèmes mathématiques. L'accélération phénoménale des vitesses de traitement ainsi atteinte permet d'envisager de nouvelles applications utiles .... ou futiles! Amazon IoT pour Noël : la Barbie connectée “pour les nuls” … ou les startups ! [lien vers l'article] Amazon livre les briques technologiques essentielles à la construction rapide de services d'objets connectés pour les entrepreneurs de startups qui ne veulent pas perdre du temps dans la construction de l'infrastructure informatique sous-jacente au fonctionnement efficace de ces objets qui vont révolutionner nos vies. Lors des projets de transformation vers Java/x86 que nous menons chez Eranea, nous voyons actuellement beaucoup de grands comptes informatiques se poser de profondes questions sur la remise en cause de leur système de gestion de bases de données “officiel”. C'est très clairement Oracle qui domine avec presque la moitié d'un marché annuel de 34 milliards de dollars des bases de données commerciales. Il suffit d'ajouter IBM avec DB2 et Microsoft avec Sql Server pour en atteindre les 80% de parts de marché. 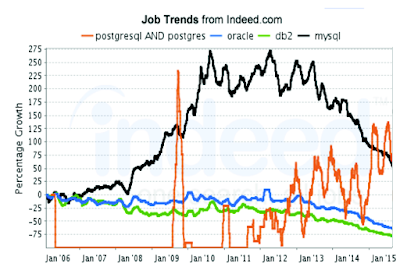 Le souci de ce chiffre quand on veut analyser les bases de données du logiciel libre (PostgreSQL, MySql,etc. ), c'est qu'il ne peut servir de base de discussion puisque ces logiciels alternatifs sont par essence gratuits (ou presque si l'on inclut des contrats de support de sociétés spécialisées). C'est pour cela que la valeur de ce marché est actuellement autour de 250 millions de dollars annuels, même si il est en croissance actuelle de 50% annuels selon les chiffres du même Gartner Group. Par essence, selon les principes de l'Open Source, il ne montera jamais vers les sommets du monde propriétaire! En effet, la table ci-dessous démontre bien que pour un serveur identique, le coût de contrat de support pour un sgbd libre n'a rien avoir du tout avec ceux de la licence et de la maintenance / assistance d'un logiciel propriétaire équivalent : au moins un ordre de grandeur les sépare ! La mutation (des esprits) est cependant clairement en cours : nous menons divers projets dont la cible après transformation est PostgreSQL, pour de très grosses bases de données de plusieurs téraoctets avec des milliers de tables servant des applications critiques du monde financier . Un épiphénomène ? 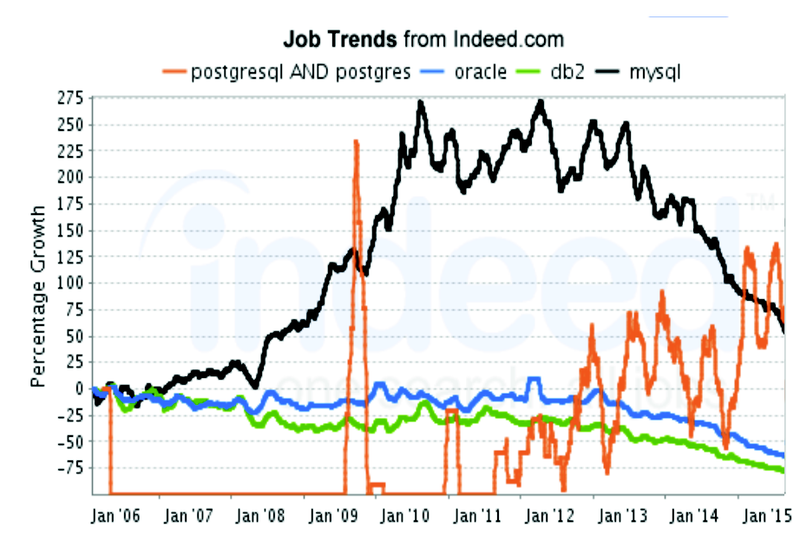 Il ne semble pas que ce soit le cas : en prenant des chiffres autres que financiers, par exemple, les statistiques d'offres d'emploi issus du site Indeed.com, on voit que la demande en compétences PostgreSQL est en pleine explosion alors que la demande pour les sgbds propriétaires régresse. La raison de cet engouement est clairement illustrée par la même analyse Gartner à 5 ans d'intervalle (voir ci-dessous): les bases de données libres gardent leur immense avantage financier (au moins un facteur 10!) mais elles ont fait entre-temps d'énormes progrès au niveau fonctionnel pour être capables d'héberger des applications critiques, en plus des applications moins sensibles. Et depuis, les compétences d'administration sont aussi disponibles ! Nos projets nous montrent que cette compatibilité fonctionnelle « validée » par Gartner est très bonne : tous les mécanismes avancés du standard SQL (intégrité référentielle, triggers, procédures stockées, architecture haute disponibilité, etc.) sont là avec le même niveau de service. Les performances aussi respectent les SLAs en place même à haut débit transactionnel ! Le seul bémol (qui vient pour une bonne partie des imprécisions du standard SQL) est que la syntaxe d'expression des mêmes requêtes est différente entre les sgbds. C'est là que nous avons décidé d'apporter notre contribution à ces transformations en développant une technologie de transformation automatique et iso-fonctionnelle (voir encart ci-dessous) tant pour les contenants (ddl de créations des tables, indexes, etc.) que pour l'accès au contenu (select, update, delete, etc.). Selon notre philosophie habituelle de transformation incrémentale et sans risque, nous avons inclus un bonus : la transformation des requêtes applicatives vers la nouvelle syntaxe est réalisée “au vol” par un intercepteur en temps réel qui masque toutes les adaptations nécessaires durant la migration. Les développeurs peuvent rester concentrés sur leurs évolutions fonctionnelles : aucune modification de leur code source. Par composition de l'évolution du marché et par des technologies complémentaires facilitant la transition comme la nôtre, on peut donc donner une très bonne plausibilité aux prédictions du Gartner Group qui prédit que d'ici 2018, 50% des bases de données sur systèmes propriétaires auront été migrées aux systèmes libres ! Update on the briefing around our solution (technology, methodology) with figures regarding current context (obsolescence, HR depletion) and the size (25+ billions dollars, 220 billions lines of Cobol, 10'000 machines) of the mainframe market. Introduction to our cornerstones : full automation and strict iso-functionality allowing incremental and fully safe transformation toward the new x86 private cloud. Toutes les grandes sociétés traditionnelles tentent actuellement de booster leur transformation digitale afin d'être prêtes à riposter au plus vite quand le Uber de leur secteur industriel va émerger. elle permet d'innover très vite, dès le début du projet de migration vers x86 / Java / web , alors même que la migration des utilisateurs et processus en place n'a pas encore débuté. Pas de “tunnel” sans fin, mais des services innovants rapidement visibles. elle permet d'innover “au-dessus” de l'existant : le nouveau service s'appuie sur tout le logiciel applicatif transcodé vers Java pour fonctionner. Il n'a pas à “ré-inventer la poudre” mais juste à développer sa propre valeur ajoutée en s'appuyant sur un patrimoine applicatif abondamment éprouvé par des années de fonctionnement sans faille. L'agilité est donc au rendez-vous! elle permet d'innover à l'échelle complète de la société : le nouveau service s'appuie sur la nouvelle architecture de migration destinée à servir – à travers la flexibilité et la scalabilité du cloud computing - la totalité de l'entreprise à un niveau de service équivalent (disponibilité, performances, etc.) à celui du mainframe en cours de décommissionnement. Cette architecture est apte à servir les (dizaines de) milliers d'utilisateurs de l'organisation donc y ajouter la charge supplémentaire nouvelle induite par ces nouveaux services n'est pas un problème ! Donc, plus de micro-prototype séduisant initialement mais passant péniblement à l'échelle par défaut d'une architecture solide : ici, l'innovation se fait directement dans les conditions de fiabilité des systèmes de production. L'iinovation est directement 100% efficace ! doter une application “historique” (= mainframe) d'une interface web (html + ajax) conforme à l'état de l'art. l'ouvrir ensuite sur Internet pour servir de nouveaux besoins: des employés équipés de terminaux mobiles (téléphones, tablettes), des clients externes, etc. La présentation ci-dessus a donc été créé pour démontrer que la frugalité (= 90% d'économies sur les coûts mainframes initiaux → des millions d'euros annuels récurrents) n'est pas l'unique livrable d'Eranea : l'agilité pour une innovation rapide et l'efficacité pour une innovation globale sont aussi au menu, au choix en entrée ou en dessert ! Le plat principal de la transformation globale est bien sûr lui toujours consommé en parallèle ! Pour les détails techniques de la solution, notre présentation de la technologie, des outils et de la méthodologie de transformation incrémentale est toujours plus complète : 40 slides ont été ajoutés pour présenter en profondeur l'interface et les services de NeaControlCenter. 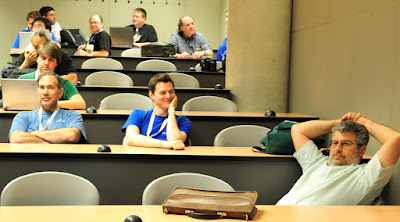 Voir ci-dessous à partir du slide 35.